European football’s governing body UEFA has sided with Ukrainian club Shakhtar Donetsk in their dispute with six South American players who refused to travel back to Donetsk, citing safety reasons, following a training camp in Switzerland. The city of Donetsk is held by self-defense forces, who are battling advancing Ukrainian forces. It lies around 38 miles (61 kilometers) from the site where Malaysian Airlines flight MH17 crashed on Thursday with almost 300 people on board. The six, Douglas Costa, Fred, Dentinho, Alex Teixiera and Ismaily, who are all from Brazil and the Argentinian striker Facundo Ferreyra, remained in Geneva following a friendly against Lyon on Saturday. “We received a letter from UEFA saying that those players who left the club should return to Shakhtar. When the incident happened, we were in Europe, so we immediately asked for help from UEFA and they agreed with our position,” said the CEO of Shakhtar Donetsk, Sergey Palkin, who spoke to ITAR-TASS. The club’s president, metals magnate, Rinat Akhmetov said on Monday that legal action could be taken against the players if they did not return. “If they don’t come then in the first instance they will suffer,” he said on Shakhtar’s website. It became clear on Tuesday that two players, Fred and Ismaily will return to join up with the club in Ukraine on Wednesday, while fellow Brazilian Dentinho will also come back in the near future. However, none of the three players are key members of Shakhtar’s squad. There are over a dozen South American footballers on Shakhtar’s books, while Taison and vice-captain Luiz Adriano, who are both crucial players for the Pitmen, flew back with the rest of their teammates to Ukraine. Shakhtar’s head coach, Mircea Lucescu, was critical of the agent of two of the players who are still AWOL. Super-agent, Kia Joorabchian, who looks after the business interests of Brazilian players Douglas Costa and Alex Teixiera is only looking for his own personal gain, according to the Romanian. “These are good players. They are under contract with the club until 2018. Their agent wants to tear up their contracts,” Lucescu added speaking to the French paper L’Equipe. 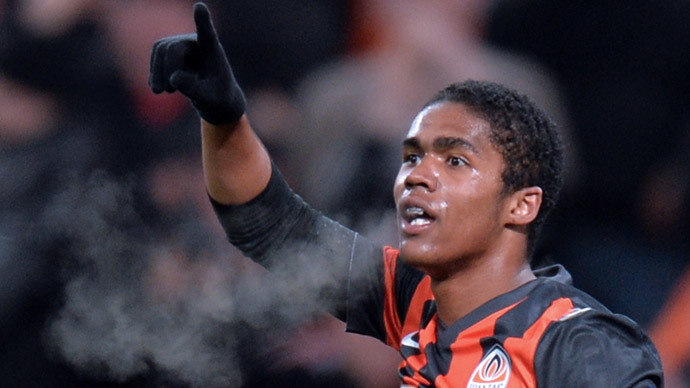 According to the website transfermarkt.de, Alex Teixiera and Douglas Costa could each command a transfer fee in the region of 17 million euros, while Fred would cost around 12 million euros, thus making it highly profitable for an agent, if that person could move the players onto another club, given the transfer and agents fees involved. Douglas Costa, gaving his reasons for not wanting to return, said the players “all run a deadly risk if we are in the region,” Costa said on his Instagram page. He said he and the other five absent players wanted to train in Switzerland during the conflict and were not seeking a transfer. “I like the club, the people, the city, but I’m afraid,” he said in comments posted alongside a picture of the Shakhtar badge. “We want to stay at the club, but we must have risk-free working conditions,” he told AP. The club has been preparing for the new Ukrainian Premier League season away from the conflict zone and is looking to base themselves in the city of Kharkov, which is under the control of Ukrainian government forces. Palkin commented that the safety of the team’s players is the clubs first priority. “Shakhtar will base itself, train and play only in those cities where the team’s safety is guaranteed. Naturally, no one is going to take the players to the places where there is fighting or even to anywhere there is even a hint of civil unrest,” Shakhtar’s CEO wrote on the club’s website. The team is currently in the western Ukrainian city of Lvov, as they prepare to face bitter rivals Dynamo Kiev in the Ukrainian Super Cup, on Tuesday.